Over 90 species of rockfish are caught commercially off the West Coast of the United States, but some deep-water species have been severely affected by overfishing. To help these threatened populations recover, fisheries scientists need to know how many fish are out there and how large they are, so that fisheries managers can regulate where and how many fish can be caught each year. 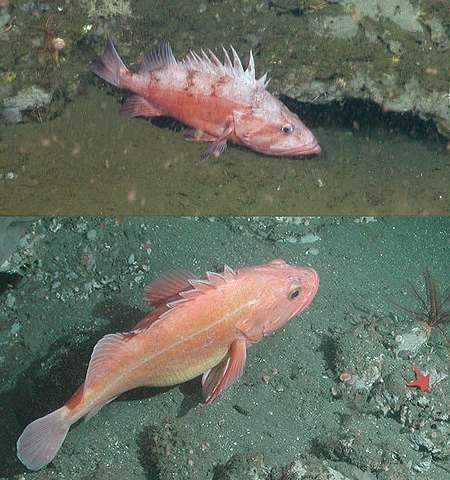 As part of this effort, MBARI recently partnered with The Nature Conservancy, Moss Landing Marine Laboratories, and other organizations to design a new camera system for counting threatened rockfish off the US West Coast. Many of the threatened rockfish, including cowcod and yelloweye rockfish, live in rocky seafloor areas 50 to 500 meters below the surface. In 2002, the US National Marine Fisheries Service created Rockfish Conservation Areas to limit commercial fishing in the areas where these fish live. 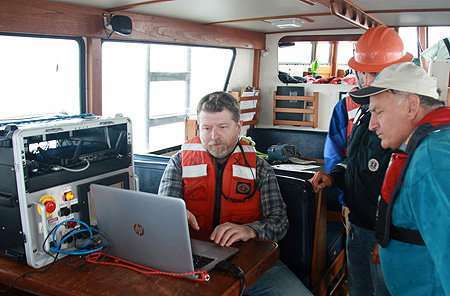 For over a decade, The Nature Conservancy (TNC) has been working with fishers and regulators to figure out the best way to determine the numbers and sizes of rockfish within these areas. This information is essential to understanding how rockfish populations have responded to protection. Each year, Fisheries Service researchers count fish by fishing for them—dragging trawl nets along the bottom. However, bottom trawls do not work well in the rocky-bottom areas where cowcod and yelloweye live. Scientists have also tried using hook-and-line fishing, but this is relatively slow and can cover only a limited part of the seafloor. A newer method of counting and sizing fish involves lowering camera systems down to the seafloor. TNC is currently using a camera system with two stereo video cameras that rotate 360 degrees over a 10-minute period, yielding a panoramic view. Unfortunately, this system is quite heavy and awkward to move from one spot to another. It can also become unstable if it lands on rough, rocky seafloor. In addition, because the cameras rotate relatively slowly, the system can only survey a limited number of sites each day, which makes it difficult to study large stretches of coastline. In 2016, at the urging of the David and Lucile Packard Foundation, which has provided funding for some of TNC's fisheries projects, TNC contacted MBARI with the idea of designing an innovative new camera system. Electrical Engineer Chad Kecy, who had previously worked on a standalone underwater camera system called SeeStar, was identified to lead this new three-year MBARI research project, which started in early 2017. 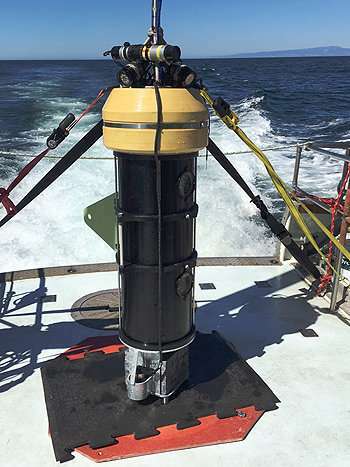 Since then Kecy and other MBARI engineers have designed and built a prototype benthic observation system, which was recently tested in Monterey Bay and near the Channel Islands in Southern California. This system can be lowered down to the bottom relatively quickly. With plenty of weight at the bottom and lots of floatation at the top, the new system provides a relatively stable platform even if it lands on uneven terrain. The prototype system uses two high-definition video cameras that can record stereo video in just a minute or two, after which the system is lifted off the bottom and moved to a new location. The benthic observation system is lowered from a ship on a cable that provides power for the lights and cameras, and carries video back to the surface. A downward-looking camera lets researchers see where the system is landing and direct it to the most appropriate spot. As Kecy put it, "The new system is a lot like a remotely operated vehicle, but without thrusters." Kecy added, "At this point we've conducted almost 50 successful dives and gotten lots of good video." The next step is for Rick Starr, a member of the research faculty at Moss Landing Marine Laboratories, to extract frame grabs from the video and use special software to stitch these images together to create stereo images. The video will be used to identify and count fish while the stereo images will be used to determine the sizes of these fish. In 2018 the research team will build a more advanced system that uses eight cameras (four stereo pairs) to provide near 360-degree stereo views of the seafloor. 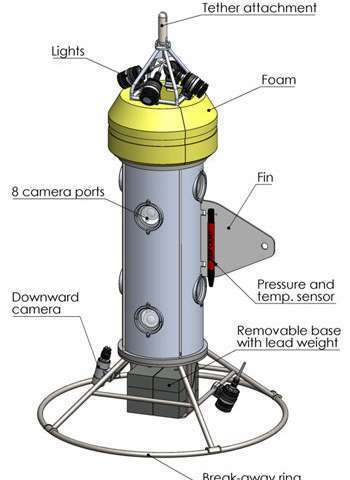 This system will also have more sophisticated camera controls and a more robust tether that will allow researchers to record and store video onboard the ship instead of inside the lander. If all goes well, the resulting system will be tested at sea in Fall 2018 alongside Fisheries Service bottom-trawl surveys. During the third year of the project, after a final design is approved, MBARI engineers plan to pass the design to a non-profit organization, Marine Applied Research and Exploration (MARE), which has the technical expertise to operate and maintain the system and to conduct rockfish surveys from boats up and down the California coast. The benthic observation system is just the latest example of MBARI research helping other organizations address important conservation and management issues in the ocean. According to Mary Gleason, lead scientist at TNC, "This project represents an important collaboration among NGOs [nongovernmental organizations], fishers, researchers, engineers, and fisheries managers to develop technology that could fill a key gap in our understanding of important fisheries and the habitats they depend on."